Before reading this topic, you might find it useful to get familiar with the Template Structure of the GridViewFooterCell. If you want to style all footer rows of your application, you should create an appropriate style targeting the GridViewFooterRow element. To learn how to modify the default GridViewFooterRow style, please refer to the Modifying Default Styles article. 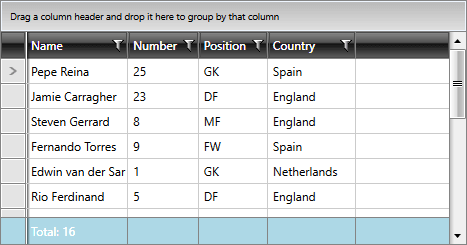 If you're using Implicit Styles, you should base your style on the GridViewFooterRowStyle. RadGridView's footer rows can also be styled by creating an appropriate Style for the GridViewFooterRow element and setting it as RadGridView's FooterRowStyle property. In order to style all RadGridView cells of an application, you should create an appropriate style targeting the GridViewFooterCell element. If you're using Implicit Styles, you should base your style on the GridViewFooterCellStyle. 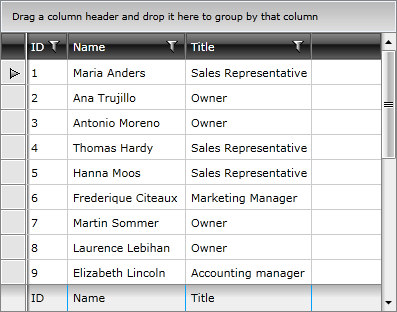 RadGridView's footer cells can also be styled by creating an appropriate Style for the GridViewFooterCell element and setting it as the FooterCellStyle property of the respective GridViewColumn.